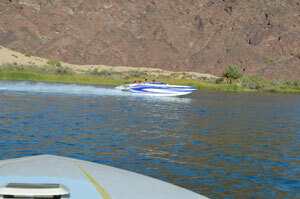 All boat designs and custom graphics are done in house by our Award Winning design team. This is where it all begins. Highly polished molds are carefully taped and then expertly sprayed to customer’s own creative designs. 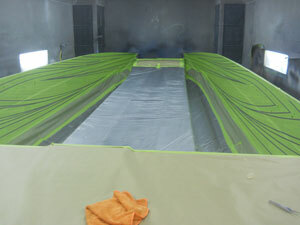 After gel-coating the molding process begins. Using only the highest grade of vinyl-ester resins along with Knytex knitted Bi & Tri Directional glass fabrics along with Baltek foam and Baltek balsa coring, the materials are precisely cut and fitted and hand laid into the mold. 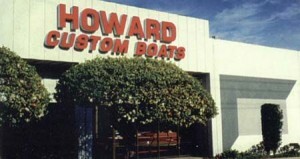 Every Howard boat is left in the mold for two weeks for proper curing and lamination time. This insures that both maximum hull strength and integrity are achieved without any distortion. 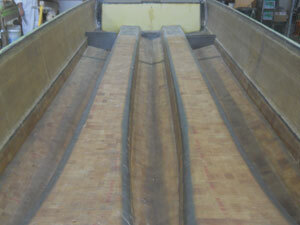 After the boat is removed from the mold it undergoes a process of extensive color sanding, buffing and waxing. This is to insure a perfect high-gloss gel coat finish. 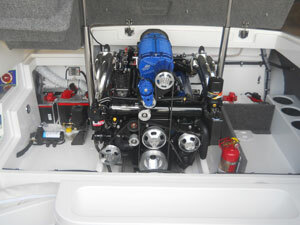 It is here that the boat receives all of the mechanical components. Utilizing only American made stainless steel aircraft-rated Allen head bolts or sockets with nyloc nuts, all hardware is thru bolted. We manufacture our own anodized aluminum motor mounts and other related brackets. All wire looms are custom made in house and are supported by stainless steel Adel clamps. All wiring is enclosed in conduit to insure against possible wear thru. Our wiring is second to none when it comes to quality of installation. We take pride in what we do and how we do it. And here is where we can really show it! We use only the finest grade of marine vinyl fabrics. Our foam is the best available. Our carpet is 40 oz. Marine grade plush pile. All wood is resin coated. All seat bases are fiberglass or billet aluminum. All staples are stainless steel. Each set of upholstery is custom made and installed by us thus insuring a perfect fit. 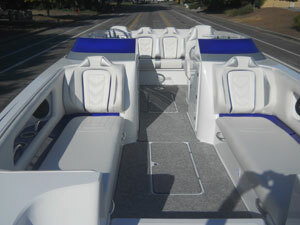 Upon completion each and every boat is water tested at Castaic Lake (located 5 minutes from us). Here we make sure that all fittings and connections are water- tight and that all systems work in the real world environment, not just on the trailer. We also fine-tune the motor to optimum settings and dial in the correct propeller to match the customers desired needs. It is now time for the big moment. 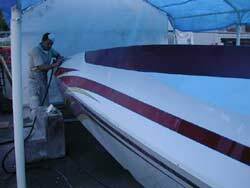 After the final inspection and detailing the boat is now ready to be delivered to another happy customer.